Day ten. Book ten. Walt Whitman shows marketers that ideals are nothing until demonstrated. It’s day ten, and we are celebrating double figures with some humanist free verse in the epic style from the "visionary nineteenth-century American poet", Walt Whitman. Published in the 1950s and revised and edited until the author's death forty years later, Leaves of Grass (the work from which this selection is taken) was a celebration of nature and the human spirit, written to reach the everyman of an all-embracing, all-welcoming America. 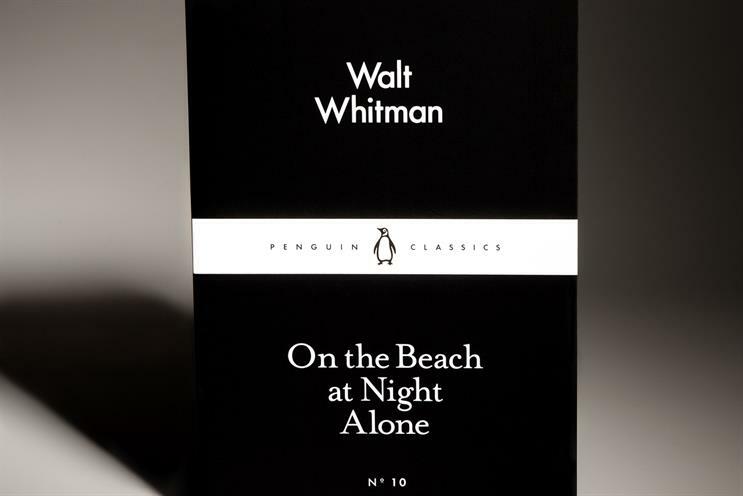 In ‘On the Beach at Night Alone’, the poem from which this selection takes its title, Whitman sets out his poetic vision of universality with the observation that "A vast similitude interlocks all". In ‘A Broadway Pageant, a multi-ethnic parade in "Superb faced Manhattan" becomes a metaphor for the globalizing forces of freedom and the coming together of all nations under one spiritual (American) flag. And in ‘Song of the Universal’, one of numerous poems that praise of the spirit of America – ‘Pioneers! O Pioneers’ being another – we hear the challenge to which, in many ways, the whole collection rises: "Come said the Muse, / Sing me a song no poet has yet chanted, / Sing me the universal." Encased though Whitman’s poetry is in the conviction (or is it more fragile – a hope?) that all of nature and all of man’s endeavor, past and present, are connected in a single unifying system, the more interesting moments come when he is joining those dots himself, rather than simply invoking the "pennant universal" of their joined-ness. When, for example, in ‘Out of the Cradle Endlessly Rocking’ a bird in plaintive song is bereft at the loss of his mate, a watching child experiences a loss of innocence: "Now in a moment I know what I am for, I awake, / And already a thousand singers, a thousand songs, clearer, / louder and more sorrowful than yours." The manifesto of one-ness, poignant though it was in a poet whose career began shortly before the American Civil War, is to the 21st century reader perhaps less original than the ways in which specific acts of poetry themselves hint at a Theory of Everything. Brands are fond of their manifestos these days, but they need to enact their miracles, not just believe in them. Brand builders should read Walt Whitman as an intellectual prophylactic the night before any sort of workshop in which grand and timeless ideals risk being espoused, because the light and shade of his poetry reminds us that such ideals are nothing until demonstrated. Giles Hedger is the chief strategy officer at Leo Burnett London & Worldwide.